We’re flexible. If you would like to create a Corporate Volunteer Day or team-building activity, we can tailor an experience for your group to include a hands-on seasonal work activity. Complete your package with great add-ons such as lunch, happy hour, professional photography to capture your team’s service or social experience, and more. Depending on the season and need, projects might include raking, mulching, weeding, planting bulbs, tree care, and more. Work gloves, tools, and water are provided. Activities generally take place 9am to 12pm or 1 to 4pm on weekdays. Recommended for a group of 20 individuals. Have another date in mind? Let’s chat. Become a Corporate Member! 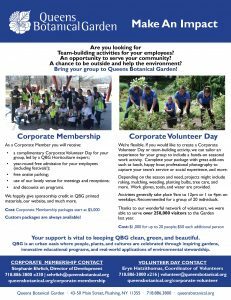 Corporate Membership includes a complimentary Corporate Volunteer Day. CLICK HERE to learn more.